It’s kind of amazing how many IKEA accessories there are and how many things can be made from them! 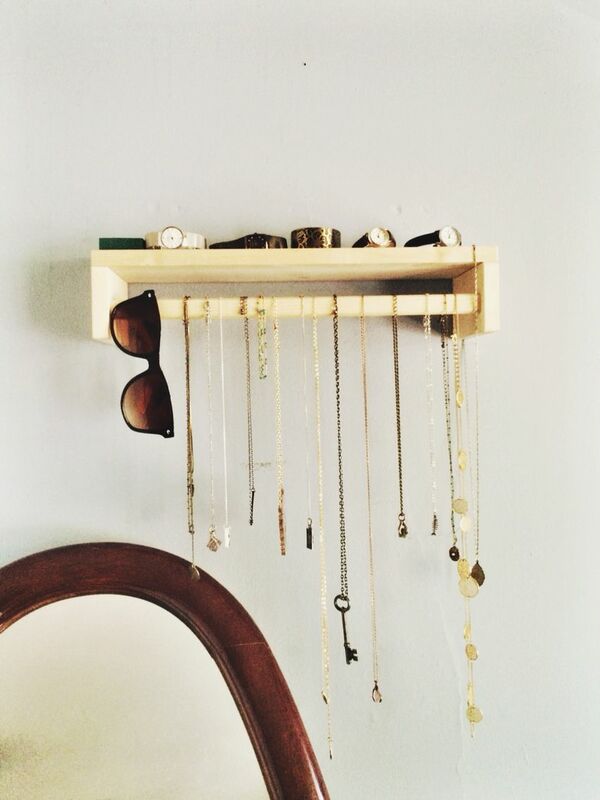 Well today we are going to put a spotlight on some Quick and Easy DIY IKEA Hacks to Organize Your Jewelry! You always need a place to put that ring when you take it off to wash a dish… or a spot to put those bangles when you start to cook and they get in your way! Of course you need a place to store all of our your fun pieces from Earrings to Necklaces and everything in between and these fun creations will help you with all of that! As you visit all of these fabulous blogs (click on the blog name in color) you will see how Quick and Easy all of these IKEA Hacks are and the bonus is is that they are ALL Budget Friendly! So put up your feet… pour yourself a cup of your favorite brew and chill for a bit and check all of these fund DIYS out! ENJOY! Come on over to Selenar Design and see how an IKEA Stodia and Alex can become and awesome Jewelry Organizer. So simple and so useful. It will have your pretties organized in a snap. Over at Melo-Drama you will see how quick and easy it is to turn an IKEA Frame into a Decorative Tray to place your jewelry of the day! Love the look and also love that there can be so many design possibilities! ENJOY! You won’t believe how an IKEA Varlera Shelf Insert can make an incredible Jewelry Storage Rack…you will see how over at Fresh Crush. It holds a ton and looks crisp and fresh! Come and see how Practically Spoiled takes an IKEA Vintermy Decoration Stand and turns it into the perfect Jewelry Stand in a SNAP! Now all the jewelry has a place the “hang” out! Time to hop on over to Curbly where you will see an IKEA Hack That Will Show You How to Make the Ultimate Jewelry Storage Solution! A place for everything and it looks great too! We are off to visit Leslie one at From Play Dates To Parties. Her hubby was not in love with her jewelry being displayed out in the open … he likes things more minimalistic…so she came up with the perfect solution that made them both happy and she is sharing it with you… check out How To Make An Awesome Hidden Jewelry Organizer with this Fun IKEA Hack! Hello Lidy is going to show you how to turn some IKEA Cutting Boards into a cool…Modern…Minimalistic Jewelry Stand that you can tweet to your home decor needs. Paint or Not… it will look incredible Come and see how it all comes together and then design your own. Casey and Bridget are going to show you how you can take this little White IKEA Tray and add a special touch to it and you have yourself a wonderful place to put your jewelry when you take it off! It’s quick… easy and fun! Oh the possibilities! This is so cool! Dee… a fabulous Neighbor from the North is going to show us how to take a simple IKEA Cutlery Rack and turn it into a fabulous DIY Jewelry Shelf with compartments! Love it! Beverly from Beverly’s Net is going to show you how to transform a simple IKEA Variera and turns it into the perfect place to store our earrings…quick…easy and budget friendly! Then you can always get yourself an IKEA Spice Rack…stain it…paint it… decorate it and hang it upside down and hang your jewelry! Super simple!